The Aldwick estate, well provided with trees and lawns, was aimed at town-dwellers who wanted a house by the seaside, and at the retired (1). Though development started in earnest only in 1928, an iron church had been opened in 1881 in the existing parish of Pagham (KD 1899). However, as a consequence of the new development, it was soon joined to Bognor. The area attracted considerable attention when King George V convalesced there in 1928 and Queen Mary inspected the new estate. The temporary chapel to which a minister, C H Mosse, was appointed in 1931, was presumably the iron church of 1881. 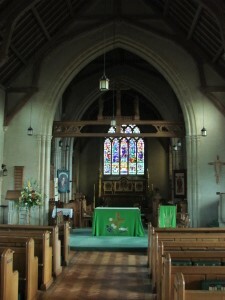 He in turn became vicar after the present church was built in 1933-34. 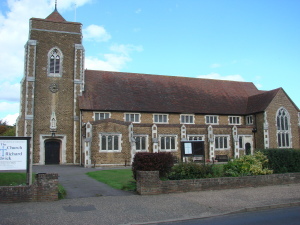 The main supporter of the new church was his father H R Mosse, the historian of Sussex churches (VCH 4 p227), who retired to the area after a career as a doctor in South London. The new church was even more of a Mosse family undertaking, since it was designed by F G Troup (CDG June 1934 p263), who as his memorial in the church reveals, was H R Mosse’s son-in-law. It cost £15,000 (CDG 18 p341) and its highly conservative gothic style, though more mixed than the C19 would have liked, was dismissed by Ian Nairn as ‘horrible’ (BE p79). To a less doctrinaire age it is the ecclesiastical equivalent of many a 1930s house, including most of those around the church, decent and well designed, but needing the re-assurance of a period guise. It is cruciform, with a west tower and built of brown stone with white dressings. The transepts are lower than the nave and the chancel is relatively short, with no concession to the age in which it was built. 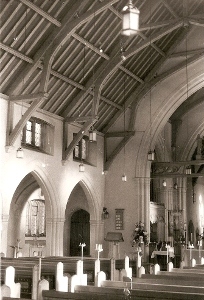 The long and strikingly broad nave has six bays and a thin hammerbeam roof, derived from C16 or C17 models. Off the south transept is an apsidal chapel and there is a baptistery off the western part of the north aisle. Capital: (South transept chapel, used as credence shelf) C11 volute capital. Noting the similarities with work of the period at Chichester cathedral, this has been suggested as the source (www.crsbi.ac.uk retrieved on 1/4/2013). Font: Large and of stone. Font cover: This commemorates the ministry of C H Mosse, who remained vicar until 1957. 1. (East window) A Lucas and R Baldwin, 1947. Lurid in colour. 2. (Three single lights in south chapel apse) Designed by D B Taunton of J Hardman and Co, 1936 (DSGW 1939) and recalling the late style of Kempe and Co.
Memorials: (West wall) Simple tablets to F G Troup (d1984) and H R Mosse (d1942). Reredos: Painted and gilded by W H R Blacking. 1. M Richardson: A Visit to the Sussex Riviera, [unpublished and unpaginated typescript in the NAL], 1990.